So, where were we last time? Oh yes, trying to speak a language knowing only a few letters of its alphabet, i.e., talking about cannabis in terms that are incomplete, irrelevant, or misleading. Not the best place to be, considering the latest technological and scientific developments surrounding cannabis -- we can do better. To begin, we can start talking about the full chemical composition of cannabis, its chemical varieties, or “chemovars”, i.e., a well-defined chemical profile -- its chemical "fingerprint" so to speak. You can find some attempts at this by several labs and websites. Unfortunately, these fingerprints are usually very basic, using only a small portion of the chemical data available-- maybe five cannabinoids and five terpenoids to identify the strain. The accompanying analysis generally offers five basic "moods" created and five basic ailments managed by the strain. Pretty rudimentary, if you ask me. Why is this? I'm not sure, but it could be because it's so simple and gives an impression of being scientific that makes us feel more confident -- I call it “pseudo-science.” Getting an actual grip on what the different chemovars are and what they can do is tough work. Think about it: Up to 100 cannabinoids and 200 terpenoids to compare and analyze in a single fingerprint. How is one to make sense of so many variables? Some cannabis scientists are turning to the methodology of metabolomics to better understand the effects of all the ingredients in cannabis, and then applying statistical tools such as Multivariate Data Analysis, and data-reduction techniques such as Primary Component Analysis (PCA) to better understand patterns and connections to create a “map” of chemical diversity. The graph at the beginning of this blog illustrates such mapping. 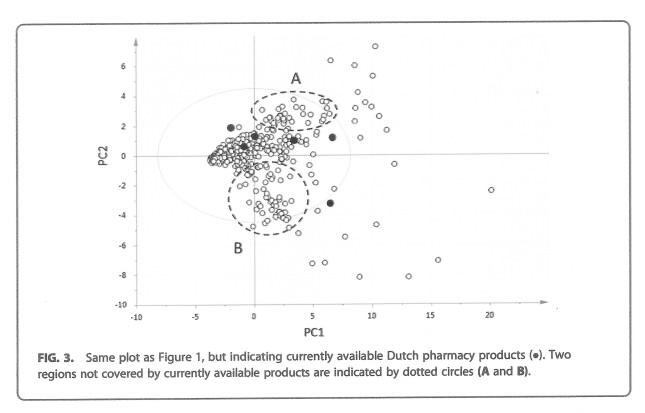 In it, Dutch researchers discovered currently available official cannabis varieties (available on prescription in Dutch pharmacies) are missing two chemovars that cannabis users find helpful with their ailments. Thus stimulating the researchers to introduce new chemovars to the official cultivation and distribution program. Of course, an even better method would be to base things on genetic DNA analysis, but this is expensive and not routinely available. Hopefully, in the near future this will change. So, what are we to do now, in practical terms? First, start asking about the chemical analysis of your cannabis -- laboratory chemical profile testing is now part of California law. At least six cannabinoids have to be tested and any mention of terpenoids requires lab testing to confirm their presence and quantity. Second, ask to have this data analyzed for you. For example: these same Dutch researchers, discovered (so far) that hydroxylated terpenoids such as guaiol, eudesmol, fenchol, alpha-terpineol, linalool, geraniol, and camphor are good chemical markers for what we associate with Indica effects. Thirdly, ask which strains show similar chemovars; in other words, which strains can be grouped together and considered similar in their effects, so that you can substitute them with each other if need be. I must say, at the moment, I doubt you will get the answers to all your questions, but hey -- your demands will determine the future of cannabis. The wide variety of strains, the super-strong THC strains, and CBD-dominant strains are proof of that.